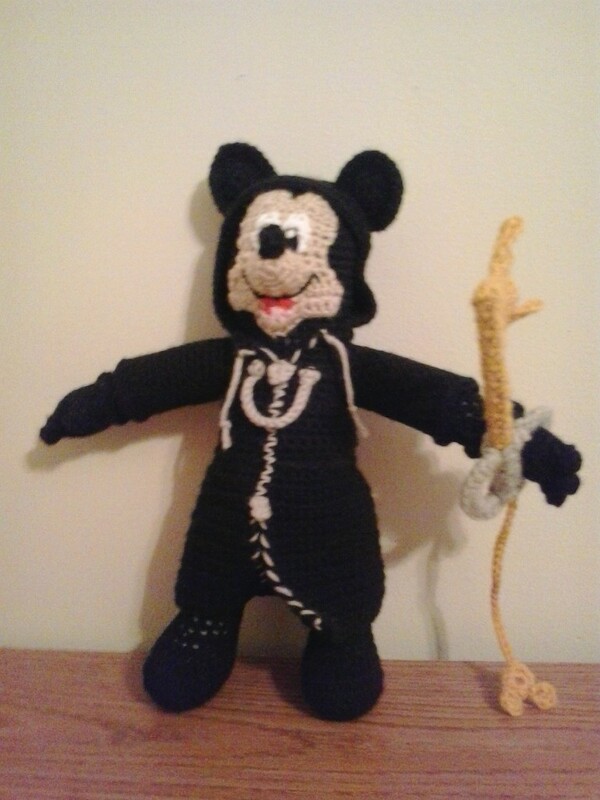 This is an adaptation of my Mickey Mouse pattern to have him dressed like the Knight Hearts version of Mickey Mouse. The basic difference is Mickey is in all black and the outfit is different. I have also included his “keyblade.” This was a request from the son of a co-worker of mine. Worsted weight yarn: Black, white, gold, red, baby pink, and buff. BEGIN STUFFING FIRMLY LEGS AT THIS POINT. CONTINUE STUFFING FIRMLY AS YOU GO ALONG. STUFF ARMS FIRMLY AT THIS POINT. WILL USE RDS 2-5 TO CONNECT THE LEGS AND RDS 19-21 TO CONNECT THE ARMS. Rd 3: 2 sc in next 4 sc on BODY, sc in next skipped sc on RIGHT LEG, working in sc behind same leg, sc in next sc, ch 1, sc in next sc, skip next 8 sc of same leg, sc in next sc, 2 sc in next 6 sc of BODY, sc in next unworked sc on LEFT LEG, working in sc behind same leg, sc in next sc, ch 1, sc in next sc, skip next 8 sc of same leg, sc in next sc. Rd 4: sc2tog, sc in next 5 sc, sc2tog, sc in next skipped sc of RIGHT LEG, working in sc behind RIGHT LEG, sc in next sc, ch 2, sc in next sc, skip next 6 sc on same leg, sc in next sc, sc2tog on BODY, sc in next 10 sc, sc2tog, sc in next skipped sc on LEFT LEG, working in sc behind LEFT LEG, sc in next sc, ch 2, sc in next sc, skip next 6 sc on same leg, sc in next sc, sc in next sc on BODY. Rd 19: holding next sc on BODY and first sc on LEFT ARM together and working through both thicknesses, sc in next 3 sc, sc in next 5 sc of BODY, sc2tog, sc in next 4 sc, holding next sc on BODY and first sc on RIGHT ARM together and working through both thicknesses, sc in next 4 sc, sc in next 5 sc of BODY, sc2tog, sc in next 5 sc, holding next sc on BODY and sc #2 on LEFT ARM together and working through both thicknesses, sc in next sc, slip st in next 3 sc. IF DONE RIGHT YOU SHOULD END 3 SC AFTER BEGINNING SC. Rd 20: sc in next 4 sc, sc2tog, sc in next 4 sc, sc in next skipped sc on RIGHT ARM, working in behind same arm, sc in next sc, ch 2, skip next 2 sc, sc in next sc, skip next 4 sc on same arm, sc in next sc on same arm, sc in next 4 sc on BODY, sc2tog, sc in next 5 sc, sc in next unworked sc on LEFT ARM, working in behind same arm, sc in next sc, ch 2, skip next 2 sc, sc in next sc, skip next 4 sc on same arm, sc in next sc on same arm. STUFF BODY FIRMLY AT THIS POINT. CONTINUE STUFFING BODY FIRMLY AS YOU GO ALONG. Finish off leaving a long tail. Weave tail through sc of Rd 41, pull tightly and secure. Weave in ends. Finish off after Rd 3 only on the first four fingers. For fingers 5 and 6, continue with hand. Finish off leaving a long tail to sew to ARM. Sew HANDS to ARMS once JACKET is finished on put on. Finish off leaving a long tail. Sew EARS to head of BODY. Weave in ends. Finish off. Weave in ends. Repeat in the other ARMHOLE. Rd 9: Ch 1, turn; sc in next 13 sc, ch 6, skip next 6 sc, sc in next 4 sc, ch 6, skip next 6 sc, sc in next 13 sc. Finish off leaving a long tail. Sew HOOD to JACKET. Using gray and starting at Rw 19 of JACKET BOTTOM, whipstitch in Rw 19, whipstitch in side of every other Rw until Rw 5 of JACKET BOTTOM. Sew side of Rw 5 of JACKET BOTTOM together. Working in side of the other side of JACKET BOTTOM, whipstitch in every other Rw until Rw 19. Whipstitch in side of Rw 19. Finish off. Weave in ends. With gray, tie double knot 1-inch from end of yarn. Tie another double knot 2-inches from first double knot. Whipstitch around side of Rw 1 of JACKET TOP. Whipstitch in side of every other Rw in JACKET TOP to Rw 5. Sew both sides of Rw 5 together. Whipstitch in side of every other Rw in JACKET TOP to Rw 1. Whipstitch in Rw 1. Tie double knot in yarn against JACKET TOP. Tie another double knot 2-inches from first double knot. Cut yarn 1-inch from second double knot. Sew Rws together from Rw 5 of JACKET TOP to Rw 5 of JACKET BOTTOM. Finish off leaving a long tail. Sew one ZIPPER PULL TAB over Rw 5 of JACKET TOP. Sew second ZIPPER PULL TAB over Rw 5 JACKET BOTTOM. Weave in ends. With black, ch 20, attach to back of JACKET. Rw 12: Turn; slip st next sc, skip next sc, 5 dc in next sc, skip next sc, slip st in next 2 sc, skip next sc, 5 dc in next sc, skip next sc, slip st in next sc. Finish off leaving a long tail to sew FACE to head. Rd 1: With red, ch 3, sc in second ch from hook, (sc, change to baby pink, 3 sc, change to red, sc) in next ch working around ch, working in free loops of foundation ch, sc in next sc. (7) Change to buff. Finish off leaving a long tail. Sew MOUTH to FACE. Finish off leaving a long tail. Sew MUZZLE to FACE. Finish off leaving a long tail. Sew NOSE to tip of MUZZLE. Using white and black, embroider EYES on FACE. Using black, embroider SMILE on FACE. Sew FACE to head of BODY. Rws 2-7: Ch 1, turn; sc in each sc across. (4) Change to gold after rw7. Finish off leaving a long tail. Wrap KEYBOADE BODY around wooden skewer, trim skewer to proper length and sew KEYBLADE BODY closed. Rw 1: Working over chenille stems, attach gray, sc enough times to cover the chenille stems. Finish off. Sew KEYBLADE HANDLE to KEYBLADE BODY. Finish off leaving a long tail. Sew MOUSE EARS to MOUSE HEAD. Attach gold to MOUSE HEAD, ch 25, slip st in bottom of KEYBLADE HANDLE. Rw 3: Ch 5, sc in second ch from hook, sc in next 3 ch, skip next sc, slip st in next sc, (sc, dc) in next sc, ch 3, slip st in last dc, (dc, sc) in next sc, (sc, dc) in next sc, ch 3, slip st in last dc, (dc, sc) in next sc, slip st in next sc, ch 5, sc in second ch from hook, sc in next 3 ch, slip st in next sc. Finish off. Weave in ends. Sew KEYBLADE KEY FINGERS to KEYBLADE BODY. 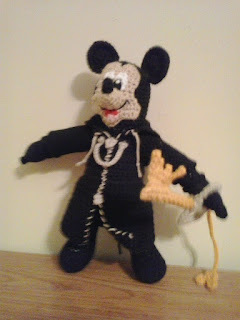 Knight Hearts Mickey Mouse is copyright Walt Disney Co. and their respective creators.